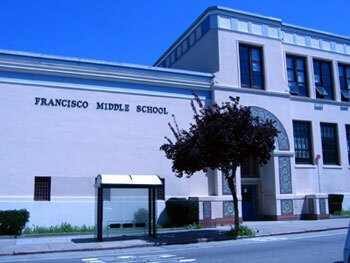 SAN FRANCISCO — Several straight students at Francisco Middle School in San Francisco’s Marina district have created a program to address homophobia in their school. Jessica Pullano, a spokeswoman for the San Francisco Education Fund, which is involved with the project, said that since none of the students are openly LGBT, they’re not calling it a gay-straight alliance. The eighth grade Peer Resources class has created Allied Allegiance, a weekly lunchtime club where students can work on projects designed to encourage acceptance. Activities include guest LGBT speakers. So far, there are 12 club members. In forming the group, the youths also got some experience in grant writing. They submitted a funding application to a panel of other students and were granted $700. The money will be used to provide lunches, produce flyers in English and Cantonese (many of the school’s students only speak the latter language), and cover other expenses. Peer Resources is a joint effort between the San Francisco Unified School District and the education fund. The program’s classes are meant to help middle and high school students take an active role in creating safe, engaging, and supportive learning environments. The club’s organizing a Day of Silence event in support of LGBT youth on April 5.